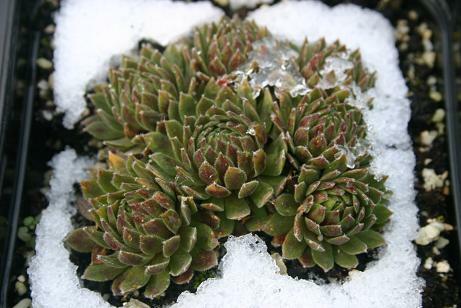 The snow made a cheerful background for the darker Sempervivum cultivars. This is 'Black Mini', not quite managing to be black but never mind. If there was no exaggeration in horticulture there would be no need for ... well, me, to be frank. A pretty little bulbous hybrid Iris that has been in flower for several weeks now. A vigorous and reliable plant in the garden. 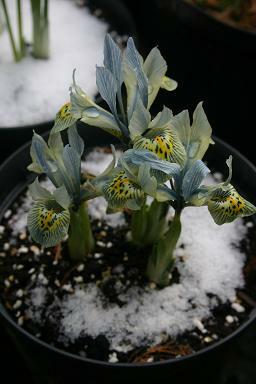 A warm protected location allows it to flower without damage in the worst of the winter. 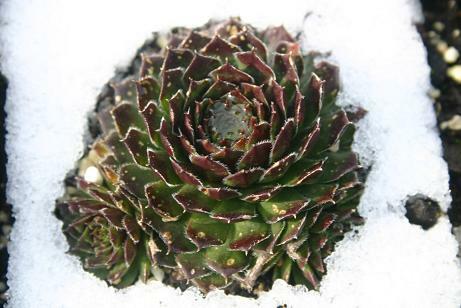 Sempervivum 'Terracotta' has attractive brownish leaves in summer (surprise). In the winter there is an appealing precision to thge pattern.